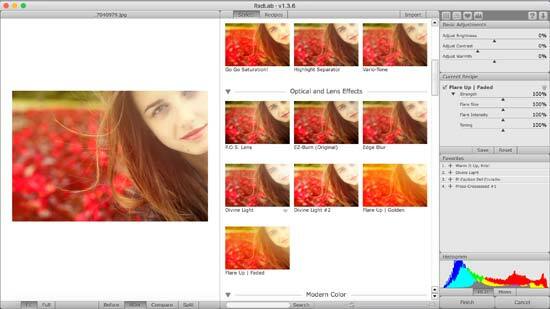 RadLab is a new plugin for Photoshop that is available to download from Totally Rad. 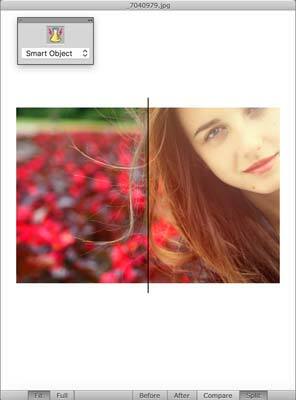 In a nutshell, it offers lots of different filters which you can apply to your photographs, either on their own or as combinations which you put together, which are called “recipes”. 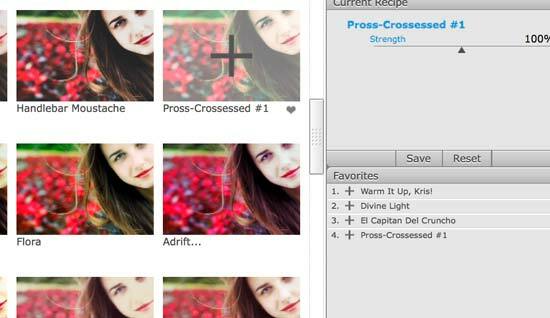 You can also export your recipes to other friends who have the software, as well as download recipes created by others. There are a selection of recipe packs which are available to download from the RadLab website. The RadLab plugin costs $149, with recipe packs available to download for free. For this test, we have used a Mac computer to work with RadLab, but it is also available to download for Windows computers. You download the installation files directly from the Totally Rad website, and once downloaded you simply double click to install the software (on a Mac - the Windows installation may be slightly different, but you should be guided with on-screen instructions). 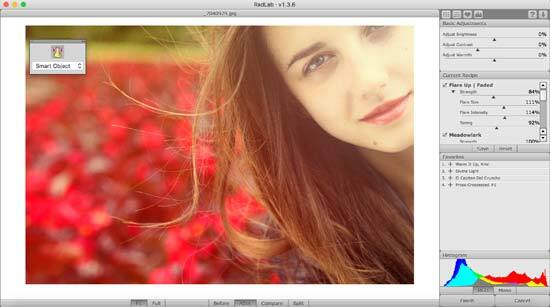 If you are already running Photoshop then you’ll need to quit that in order for the software to install properly. Once you’ve made your way through the different installation steps, you should see you’ll be able to install the software as a trial, or enter a code if you have already purchased the software. Once you have installed the software, you’ll be asked if you want to watch a video to learn how to use it. The video is only one minute long and is worth a watch as an introduction. Totally Rad claims that Rad Lab is “ridiculously” easy to use. 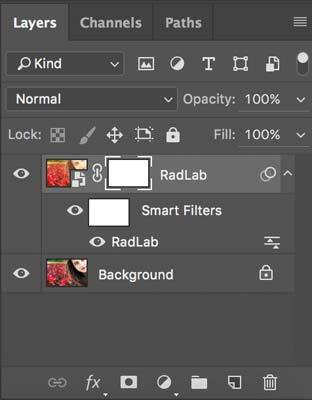 Next time you open Photoshop, you’ll see that a small window appears with “Open Radlab” at the top. Just underneath this is a drop-down menu which you can use to choose between the edits you make being added to your image as a Smart Object, as a New Layer, or as part of the Layer you’re already working with (which will be the background layer if you’ve not made any). It’s recommended that you choose Smart Object, but at the very least create a new layer so that you can remove the effect from your image if you wish to at a later stage. 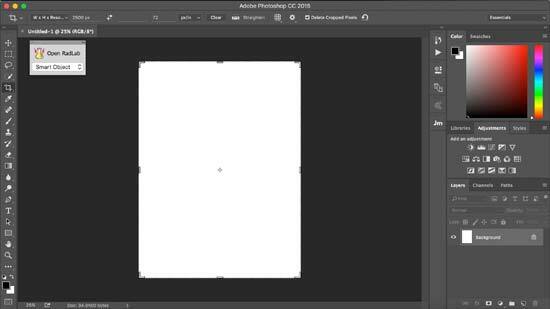 First of all you need to open whatever photo you’re working on in Photoshop. You can either make edits in Photoshop first and then load up RadLab, or you can just load it up straight away. 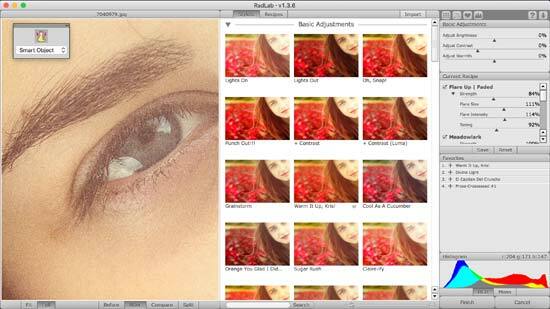 You can always make more edits once you have finished in RadLab if you like. Once the plugin is opened, you’ll see that you’ve got quite a simple interface to work with. On the left hand side you’ll see whatever photo you’re working on, while in the middle is all of the preset filters (Stylets) which you can add. 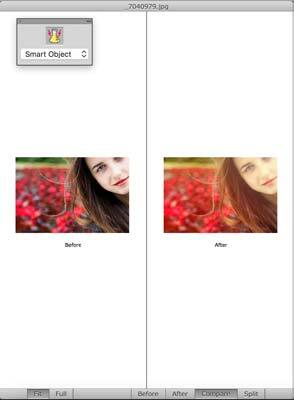 To the right is where you can make adjustments to the preset and your image. In the middle, where you see the presets, it’s probably easier if you use the slider at the bottom to make more of the presets fit on screen. Since there’s dozens to choose from (80 in total), it makes it easier to browse through what’s available. If you know the name of the Stylet you want to use, there’s a search panel at the bottom - if you start typing its name you’ll see the rest of the thumbnails disappear and leave you with the one you’ve been typing. 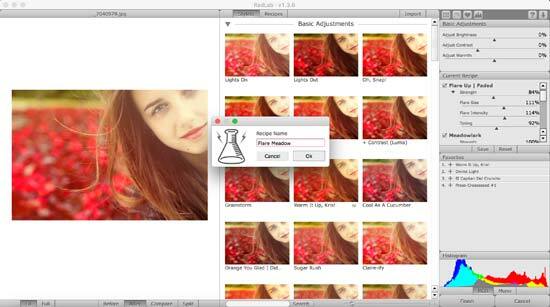 This can be a quick way to edit once you’ve got to know the names of each of the filters. Each thumbnail will show you how your photo will look with the filter applied, and if you hover over any of the given photos, you’ll see that on the left, the photo has the filter applied to give you a preview. The Stylets are divided into various categories, including Basic Adjustments, Optical and Lens Effects, Modern Color, Vintage Color, Black and White, Sharpening. Underneath each Stylet you can click on a heart icon to add it to your favourites list - which appears on the right hand side if you add a preset to it. This is a useful way to group together a few of your favourites to save you scrolling through everything which is available. 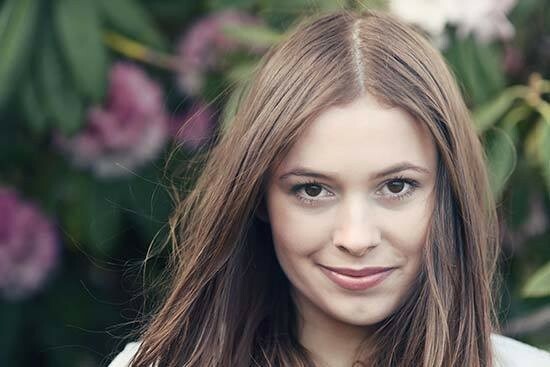 Once you’ve found one that you want to add to your image, click in the middle of the thumbnail (you’ll see a + sign). You’ve now started creating a new “recipe” which means that you can continue to add different Stylets together. After you add the first Stylet, you’ll see that all of the thumbnails now look different, because it has updated to show how the filters will look together, rather than on their own. 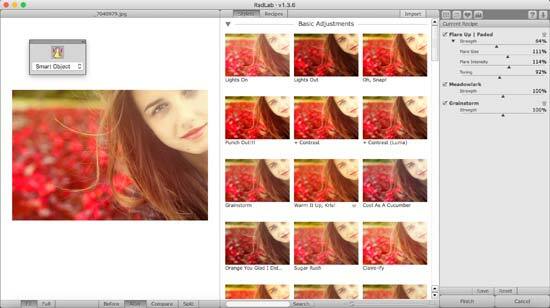 Look to the right and you’ll see that you can make edits to each individual filter. The options you’re presented with varies from filter to filter, but generally you’ll at least be able to adjust the strength (or intensity) of the filter. If you have more than one filter, you’ll see that you can still adjust each filter individually, just scroll down to make adjustments as you see fit. You can add any number of Stylets to create a combination, of course based on personal preference. If you’re particularly happy with a combination you have created, you can save it as a recipe so you can use it again with another image if you like. Click Save underneath the “recipe” panel and you’ll be asked to give the recipe a name. Under the recipes tab at the top of the screen, you’ll now find you can access it whenever you like it. You can also click Reset instead of Save if you want to go back to the beginning and start adding filters from fresh. Another thing to mention about the tabs on the right hand side of the screen is that you also have some basic edits, you can adjust Brightness, Contrast and Warmth. Of course you could also do that in Photoshop itself before you start, but it’s reasonably useful to see how these kind of edits will work with a filter of your choosing, too. There are icons at the top of the right hand side which allow you to change the display of the software. If you click the one on the furthest left you can switch off the thumbnails to get a larger view of your image. You can also get rid of any of the tabs that you don’t want to see - such as basic edits, or the histogram which appears at the bottom of the screen. 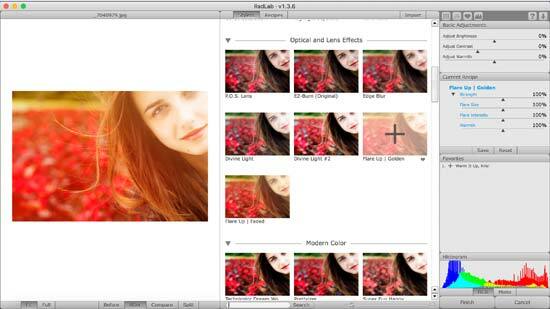 On the left hand side of the screen where your image is displayed, there’s also some display options. To the far left you can choose between “Fit” and “Full”. Fit will, as you’d expect, fit the image in the box so you can see the whole thing. Full, on the other hand, will display it at 100%, and you can move around the image to see a close-up of it - this could be useful if you want to see how a particular area of your image has been rendered with the filter applied. To the right of this area, you’ll see there’s “Before”, “After”, “Compare” and “Split”. Before shows your image as it was when you started, After with the filter(s) applied, Compare will show you the before and after displayed side by side, while Split will cut the image in half, with the left hand side showing it in its original state, and the right hand side showing it with filters applied. Once you’re happy with the finished combination of filters and you’re ready to go back to the main Photoshop screen, click Finish. 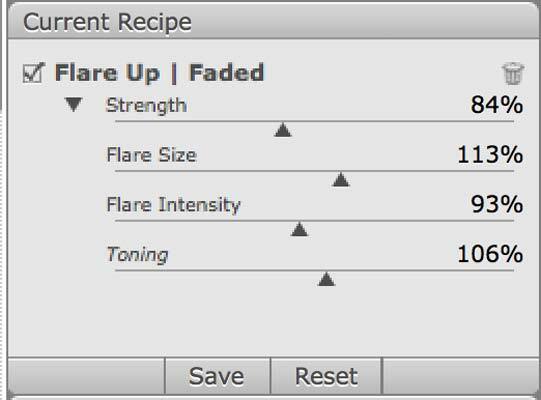 You’ll be taken back to Photoshop and it’ll say “applying recipe”- this should only take a couple of seconds. 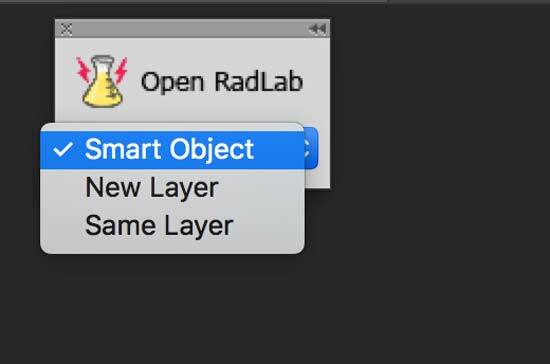 You should now see that it has been applied either as a Smart Object or a new layer if you selected that at the start. 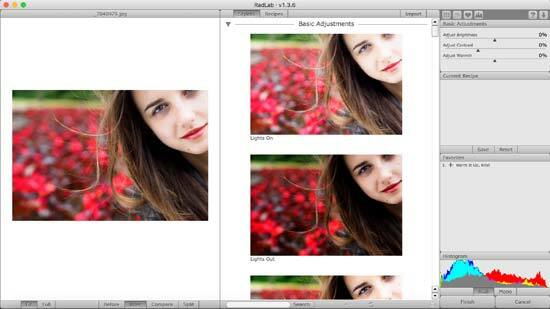 Click the eye icon next to the layer to switch it on and off to compare against your original image. 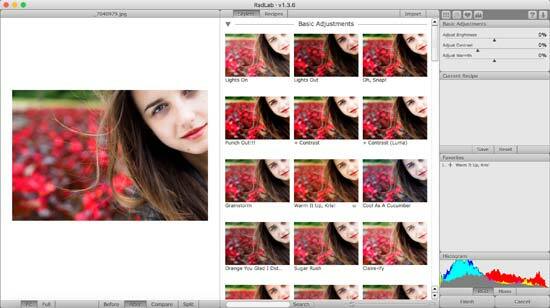 You can use RadLab with Actions and Batch Processing in Photoshop. 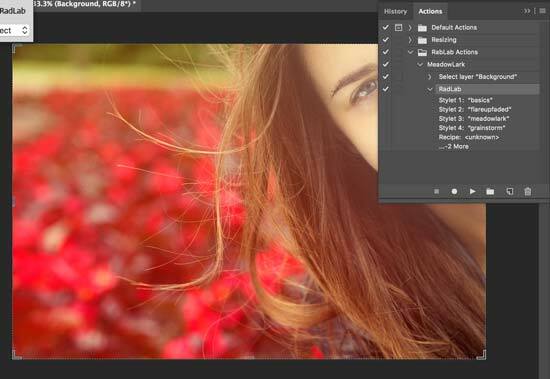 To do that, just create an Action as you ordinarily would in Photoshop, but use RadLab to add your filters etc. Then you can use Batch Processing, or just have a shortcut to your favourite recipes that don’t necessarily involve launching the entire plugin.